Lent truly is a countdown to Easter. as we await the resurrection of our Lord. 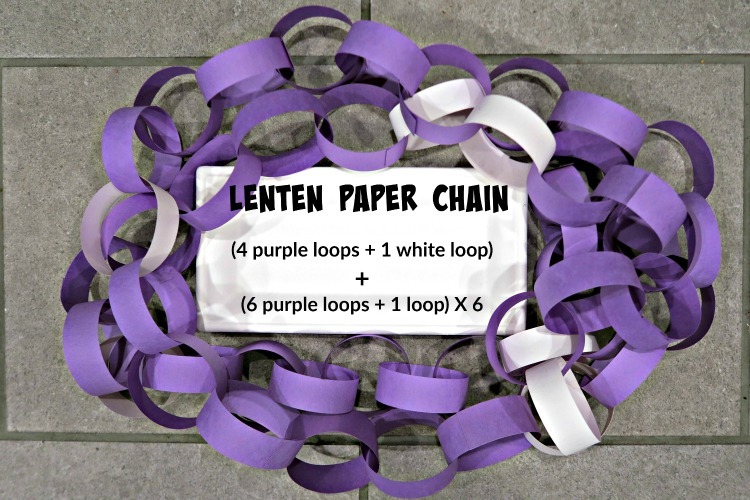 A countdown chain gives kids a more concrete understanding of how many days are in Lent and a visual for how long Lent will continue. 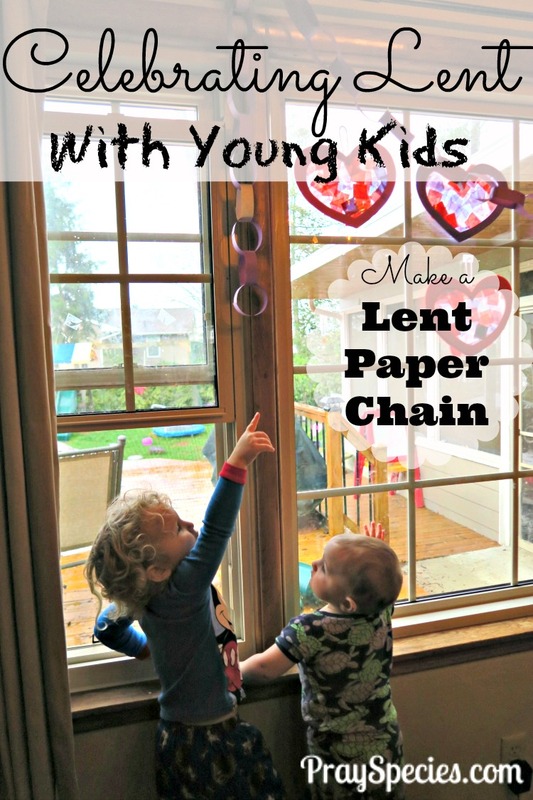 A paper chain is also simple and quick with little mess, all bonuses when it comes to crafting with preschoolers and toddlers. 1. 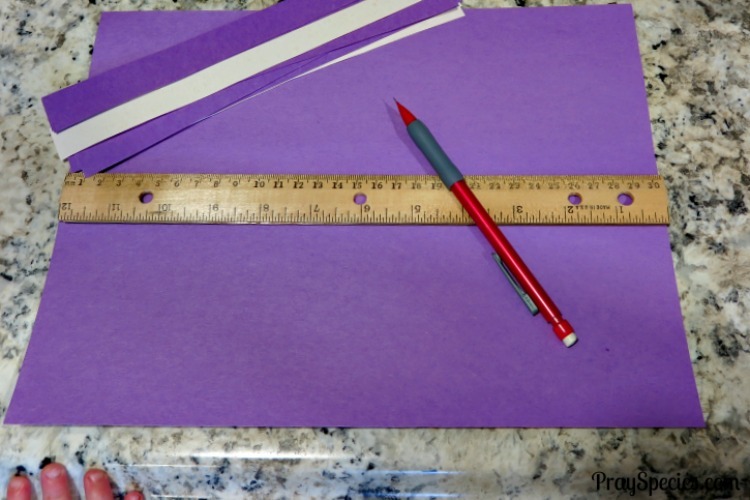 Measure across the construction paper and mark at every inch. You will need to make 40 purple strips and 7 white strips. Tip: I cut all the construction paper into equal pieces so there are extra strips if needed. This is sometimes a necessity when making anything with little ones, especially when using paper, scissors, and glue. 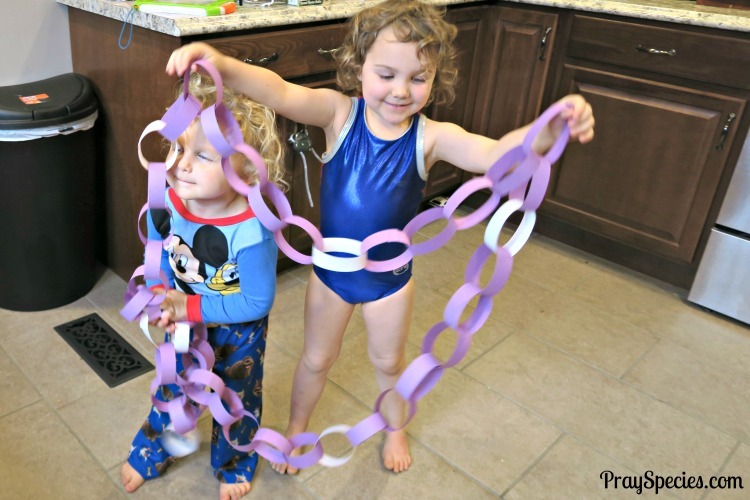 Take one purple paper strip and bend it to form a circle. Glue the ends together. Loop another purple paper strip through the first and glue the ends to form a chain. Repeat with two more purple loops, till you have four purple loops in your chain. These four purple loops are Ash Wednesday through the first Saturday in Lent. Then, add a white loop to the chain for Sunday. Then add to the chain, six purple loops followed by one white loop. Repeat this process alternating six purple chains followed by one white chain six more times. These loops represent the remaining days until Eater. then 6 purple loops + 1 white loop (repeat this step 6 times). Hang or display the chain. We have ours hanging over the window’s curtain rod. Cut or tear one chain for each day leading up to lent. Lent is an opportunity to prepare for Easter. As Catholics, we use Lent to honor Jesus’s sacrifice when he withdrew into the desert for 40 days. Lent begins on Ash Wednesday and ends on Easter Sunday. Why is Lent so long? Most youngsters won’t realize that even though there are 40 days of lent, there are 46 days between Ash Wednesday and Easter. There are 46 loops in the paper chain we just created. The quick answer is that we don’t “count” the Sundays. A more thorough explanation of how this came to be can be found on U.S. Catholic. Go easy on yourself Momma, , this activity is meant to foster connection and understanding, not be another challenge to fight through! The chain makes for a wonderful tradition. It’s also one of the first traditions kids can start doing on their own. If gluing them altogether with very young kids (like me) it helps to divide and conquer, i.e. everyone gets to do seven chains or do a little each day until it’s done. And more good news, if by the time you are reading this Lent has already started you can still do this for all the days left…. or the image below is perfect for pining for next year. Almsgiving – Toddler Friendly Lent An Easy Way to Show Holy Week in Your Home We Are God’s Toddlers A Confirmed Cradle Catholic – Welcome Home!